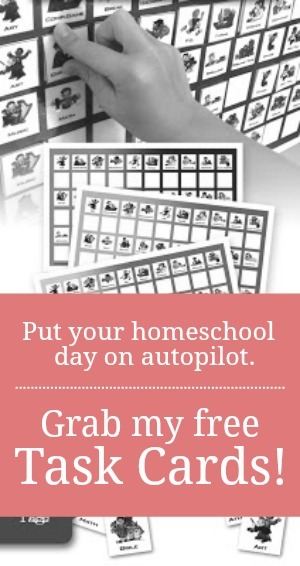 In my first few years of homeschooling, I tried to cram all-the-things into every single moment of our days. I was so afraid that I'd miss something, that I'd forget to teach a crucial element, that I'd leave gaping holes in my kids' learning. I felt the full weight of their education and wore it like a burden around my neck. But, I'm soooooo over that guilt. It's not mine to carry. The truth is, I can't possibly teach them everything there is to know about everything. Learning is a life-long process. I'm thirty-sevenish and I still don't know all-the-things. But, I keep learning. I keep growing. I keep searching for right answers. And if I can inspire a love of learning in my kids, they will keep searching too -- at ten, at twenty, at one hundred twenty. I can inspire them to WANT to know more. And what's more, I can ever so gently sneak in all kinds of learning into our days without adding anything extra. My days are bulging already. I need less doing and more being. So sneaky learning allows me to teach my kids all those things that I might otherwise overlook...or dare I say, not have time to teach. Six or seven years ago when my oldest kids were just starting their homeschooling journey, we spent two memorable years learning all about America's highs and lows...from the pilgrims to the war on terror and everything in between. Since I don't believe in teaching history in chronological order, it was only natural that I'd begin those formative years by immersing my kids in American history. We read books. We did projects. We reenacted and retold. And by the end of those two glorious years, my oldest kids could speak American History fluently. Like all good things, our look at this country's rich heritage came to an end and we moved on...or moved back...to Ancient Egypt and all the rest. I know we'll eventually cycle around to American History once again. But for now, it's in our rearview mirror. My older children have fond memories and a sturdy foundation of the American portion of the timeline that they'll carry with them until their jr. high and high school days when we'll revisit that section of history. But my littlest ones were just babes all those many years ago when we first "landed" on Plymouth Rock. Since they don't remember our look at the Revolution or the Civil War, it's only natural to assume that they know nothing about those wars or the people that fought in them. On the contrary, my younger kids have a strong grasp of American History...even though they've never had one formal American History lesson. While "formal" is good, sometimes "sneaky" is good enough, if not better. My kids learn organically while living real life. 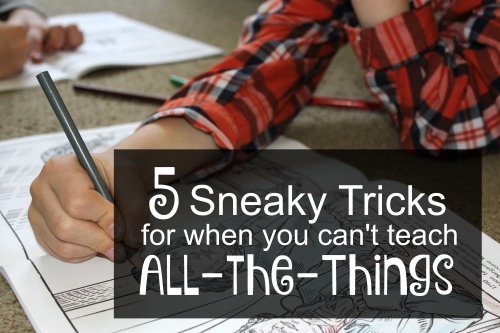 Here are five simple tricks for learning when you can't teach-all-the-things in your homeschool. Each month, I assign my kids to read a language-rich chapter book. These are intentionally selected living literature style books -- classics, quality fiction, and biographies. I choose books that I think they might be interested in reading, books that will challenge them spiritually, and books that will fill in some of the gaps of their education. I don't need to drill them on the facts of American History. I can just hand them Across Five Aprils for a peek at the Civil War or Sarah, Plain and Tall for a look at the hardships of the frontier. The literature captivates them and sneakily teaches them all about American History in a way that only really great living literature books can. Allow handwork during read-aloud time. I spend over two hours reading aloud to my kids each day. I read a bit in the morning. I read a bit in the afternoon. Added together, our reading times amount to hours upon hours of reading each week. With five kids, four of whom are really busy boys, read aloud time can quickly morph into a frat party if I'm not intentionally providing handwork for my kids to do. Handwork is my secret sauce for not only occupying busy hands during long stretches of quiet reading but also for sneaky in lots of learning. To be honest, it's sometimes difficult to find handwork that interests my boys. They're just not that interested in crafts and I'm just not that interested in shenanigans. A few years ago, I stumbled upon Dover Publications and their detailed historical, cultural, and scientific coloring books. These little paperbacks instantly became my new read aloud BFFs. I placed a half dozen of them in a large handwork bucket along with a box of colored pencils and a few sharpeners. 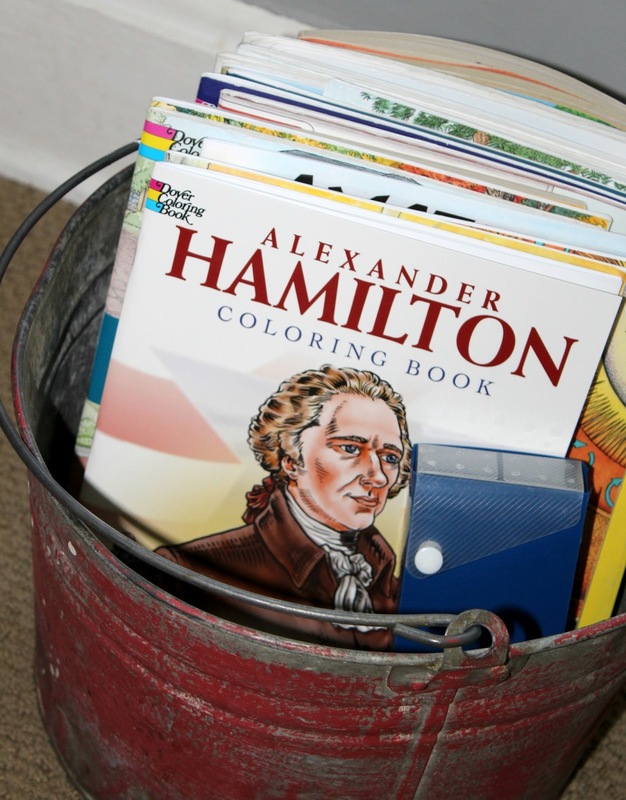 Each day my kids chose one book out of the bucket. They all spread out around the living room and began to color. I read for a ridiculous amount of time with no interruptions, no noise, no chaos -- only the quiet hum of pencils on paper. 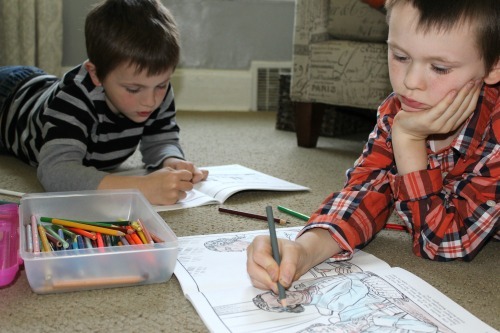 Even though my boys are getting older and have a longer attention span, we still lean heavily on the Dover coloring books at read-aloud time. We prefer simple ones like The American Presidents book or the United States book. 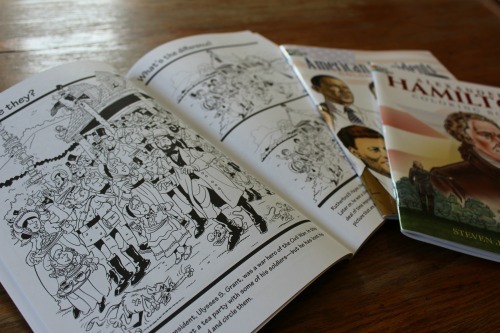 But we also add jazzier books like the Standups! 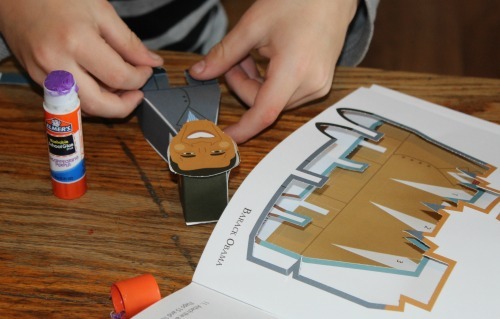 President paper puppets and the White House Cut & Assemble kit from time to time. 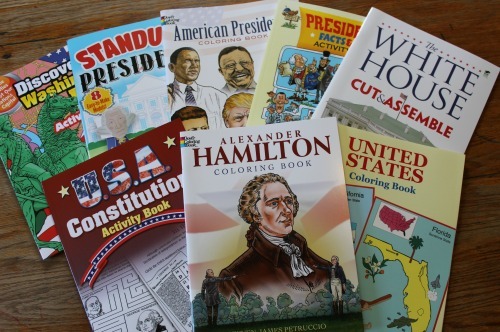 Not only does my basket of Dover books occupy little hands, it also introduces my kids to the American greats like the presidents and the landmarks. Each page has a detailed picture and a short narrative that sneaks in a few American history facts that I would not otherwise have time to cover. 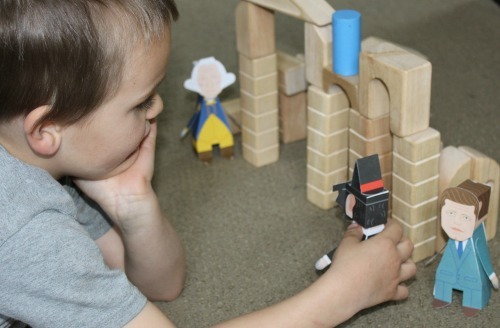 Encourage the use of audio dramas during play time. Playtime is prime time for learning around here. All I need is an interesting audio drama to sneak in some purposeful learning. When my boys are playing Legos in their room...audio drama. When we're driving to grandma's house for the day...audio drama. When my daughter's giving the dog a bath...audio drama. Over the years, I've gathered the names of some of the best historical and scientific audio dramas on the market. Whenever I'm in need of some sneaky learning, I reserve one from the library, provide time and space for boredom, and capitalize on all that dead air space during playtime, travel time, and chore time. My kids have learned everything from the courage of Nathan Hail to the battle plans of General Lee while listening to audio dramas. Provide purposeful activities during buffer moments. We're not really a screen family. We don't have TV access. We're not gamers (although I think The Hubs still has his original Nintendo in a dusty box somewhere in the basement.) We prefer good ol' fashioned boredom busters like quality books, crossword puzzles, and board games. Although our car came with a DVD player, on long car rides, we rarely opt for a movie. I pack a bag-o-fun next to each kiddo and fill it with find-and-seek animal books, magnetic hangman sets, and puzzle/activity books like the Discovering Washington, D.C. activity book that's filled with word scrambles, crosswords, and fun facts about real people and real places in history. 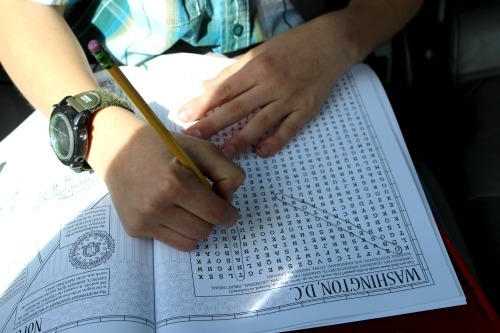 During those times of long pauses in the car, at the doctor's office waiting room, or at a sibling's piano lesson, I can sneak in five to ten minutes of learning. It's not much, mind you. But over time, those buffer moments sure add up. Permit coloring books while notebooking. Some of my kiddos are not natural artists and at times become discouraged by their inability to draw historical figures to illustrate their notebooks during history. Enter Dover Publications coloring books yet again. I purchase the historical sets like Alexander Hamilton or Renaissance Fashion to help them notebook with confidence. 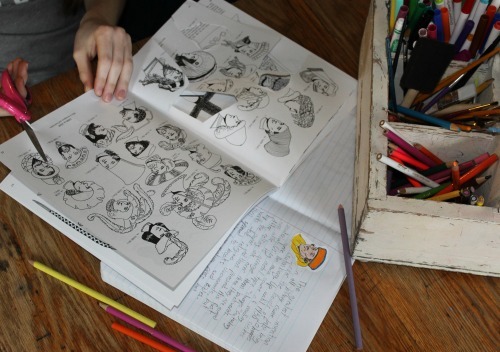 I take the coloring books apart, allow them to cut out, color, and glue the pictures into their history notebooks to go along with their narrations. My kids are much more eager to notebook when they can do so with ready-made pictures. 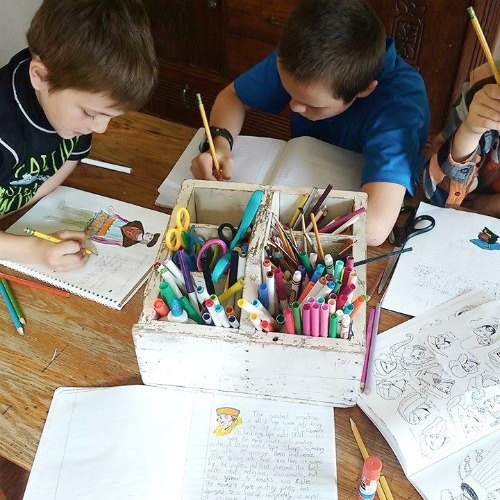 In addition, I often allow them to use the nature-themed coloring books when they are drawing pictures in their nature journals. Field guides are nice. But, the life-like photos and paintings of these professional guides are sometimes difficult for my children to recreate. The black-and-white animal sketches found in Birds of Prey or Forest Animals coloring books provide easy-to-copy nature examples. I can't teach all-the-things. Spoiler Alert: I'm only one itty-bitty woman with a very finite ability to do one thing at a time. With five unique kids to teach and five unique educational paths to juggle, I simply can't cram all the learning into the regular lessons. But, I can sneak it in. My younger kids have never had a formal American History lesson in their lives. But, I dare you to try and stump them with US Trivia. They've learned a surprising amount of American potpourri and I've never had to drill-and-kill all those facts into their heads. They've learned it all organically. Another colouring option you might like is Homeschool in the Woods "History Timeline Figures" (see http://www.homeschoolinthewoods.com/timelinefigures.html). We bought it for this upcoming year for our dds to enjoy colouring characters while I read Story of the World. Thanks for sharing. I'll have to check those out. We enjoy Dover coloring books for the same reasons. We also have just discovered the sticker-by-number painting books and enjoy the Usborne educational sticker books in the car. I've got one that can't to do much reading or coloring the car or he gets car sick. Sticker books seem to be just enough to occupy him without all the concentration of actually reading. I am absolutely thankful for stumbling on to your beautiful page! I have been struggling with those exact fears and thoughts when it comes to homeschooling a range of ages. (Quick turn on Keith and Kristyn Getty.) Looking forward to reading your book.